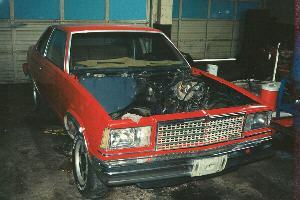 This picture is after the anemic 267 V8 and the Turbo 350 transmission were pulled. 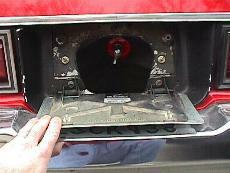 A block-off plate I fabricated was installed to cover up the hole created when I removed the A/C and heater box. 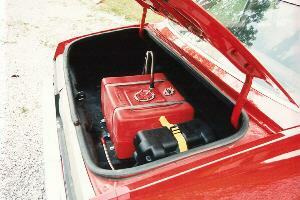 Later I detailed the engine compartment. 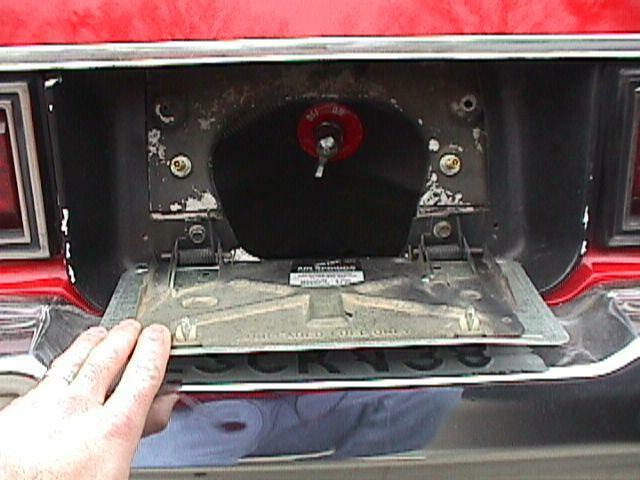 This picture is when friend Tim Baker and I were fabricating and installing the 6 point roll bar, using a seat as a reference point for locating the roll bar. 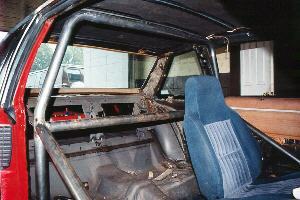 This is the completed roll bar, and trying to locate stuff such as the shifter, 5 point saftey harnesses and getting ready to reinstall the interior. 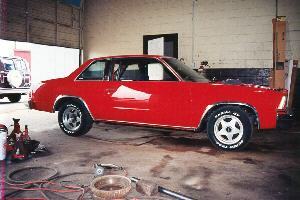 This is the Malibu after the engine and rollbar was installed. The stock rearend and suspension is still in place, as is the tires and wheels that came with the car when I bought it. 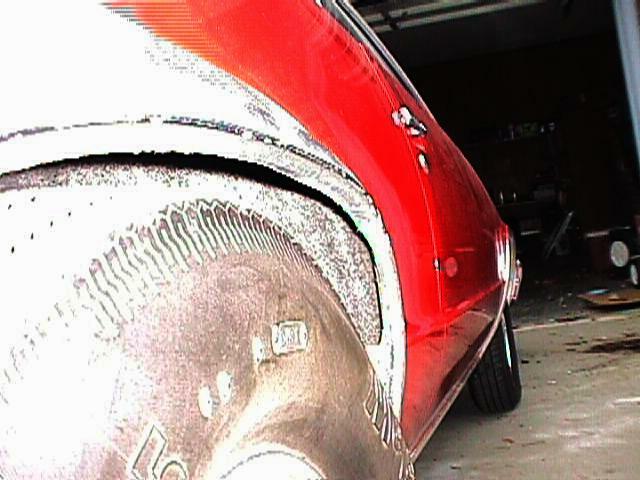 This is after my 9 inch Ford rear was installed. It sat up too high in the rear with the new rearend in place. The spring perch locations were slightly higher than the factory 10 bolt rearend. 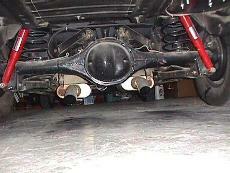 Later I added the Moroso Trick rear springs, which lowered it about 2" in the rear, as you can see below. It has a really nice stance now. 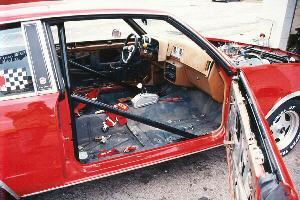 The interior and hood has yet to be finished in this picture. I also haven't installed the "skinnies" on the front, yet. Click on picture to see a 640X480 version. 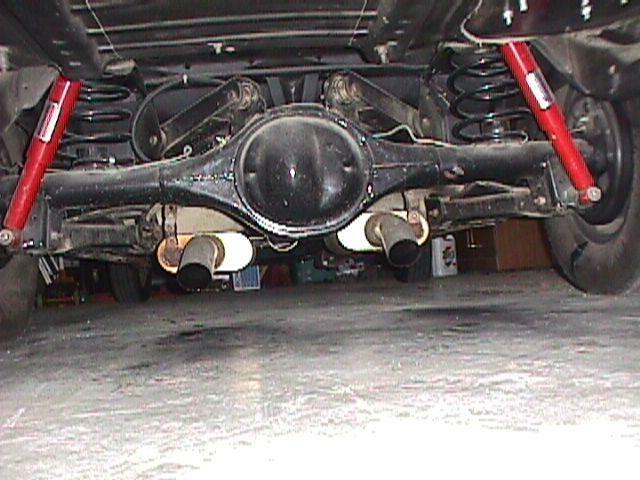 Here's a shot of the Ford 9" rear setup. 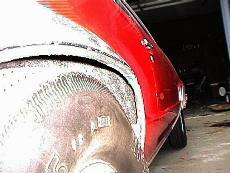 As you can see, I'm using the stock upper and lower control arms, and plain 'ole Gabriel gas shocks. The only mods are Energy Suspension polyurethane bushings throughout, Moroso Rear Trick coil springs, and homemade boxed control arms. It is very effective, and works great. 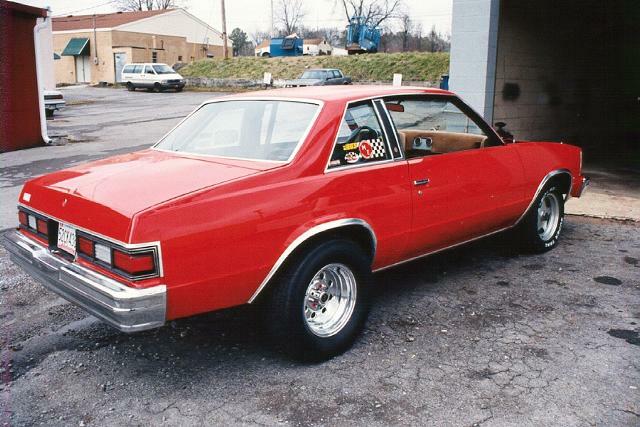 Chuck Samuel was able to run low 9's with a similar type setup on his old El Camino. Now, if I could only run low 9's in the 1/4!! So you want to stuff mondo tires under your wheelwell? Here is one way to go about it. Notice the fender lip is cut out all the way down to the "M" on the McCreary tire in this shot. This is a L60-15 tire, which is equivalent to a 275/60/15 BFG Radial. Fit is tight, but doesn't rub. Picture is kinda' crappy, flash is a little too bright! Rules, rules! The rule is, if you relocate your battery to the trunk, you've gotta' have a battery disconnect switch. Since I removed the stock fuel tank, and the filler neck is gone, I put the battery disconnect switch behind the tag. It is hidden this way, and I remove the tag if the Tech guys want to complain. Also, this is a nice little "security" device. I can disconnect the battery when I park it, The car is disabled. The switch is hidden from a wannabe thief. As you can see, this is the installation of a Harwood fuel cell and relocated battery in the trunk (doesn't leave much room for luggage!) 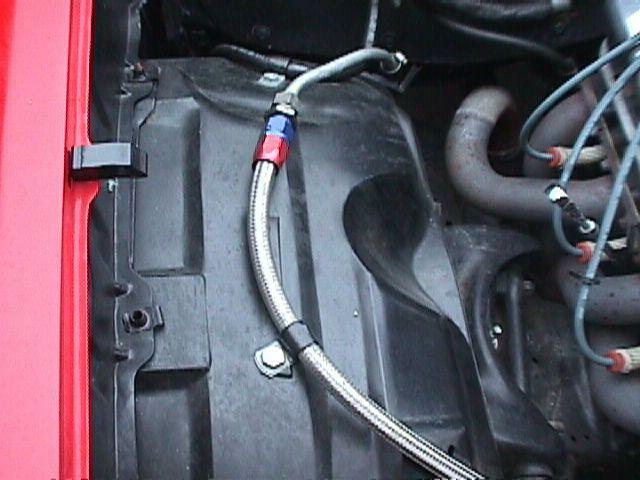 Click on picture to see a 640X480 version Here's a shot of the fuel line. I run -8 AN stainless hose from the fuel cell to the trunk floor. There I use a bulkhead fitting. On the other side of the bulkhead fitting I convert to 1/2" aluminum tubing to the front. On the top of the wheelwell, I convert it back to -8 AN stainless flexible hose. The reason I used aluminum tubing is because it is MUCH cheaper than the stainless hose. Also, it is said to flow better than the stainless hose.